I’m falling behind in my reading doubly so as there is a new Ancient Warfare due any day soon and with it another Wargames, Soldiers and Strategy. A new Strategy and Tactics hit my desk yesterday (actually I think it arrived last week but I was off with the manflu). 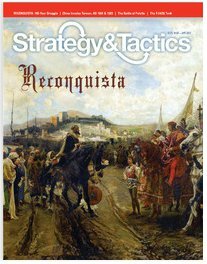 This issue has the Reconquista as its main theme. Apart from Charlton Heston as el Cid, about all I knew of the Reconquista was that the Christian princes of Spain along with their knights threw the Almoravid Muslims out of Spain with Granada being the last place to be liberated. I guess I have some reading to do there. I just hope it will not be too bright and shiny and dazzle me away from my other wargame projects. Also in this issue is a piece on the Chinese v the Dutch in Taiwan in 1661 and 1683, especially around Fort Zeelandia. That is another out of the way campaign that has interested me for a while and in particular since March 2009. The other two main pieces are a Campaign Analysis on the Battle of Peleliu in 1944 in the Pacific. There is also an analysis of the T-55 tank. I enjoy reading Strategy and Tactics, doubly so as they supply the magazine only or the magazine with game. Getting the magazine only means I don’t end up with a room full of games that never get played ((like that could happen to any wargamer … right!)). The other magazine I have not had a chance to read through yet is last month’s World at War. I have managed to read most of the article on The Naval War on Lake Lagoda. That was fascinating enough to have me start looking for models at Skytrex or the PT Dockyard. At least I would not require too many models for gaming this fascinating part of the struggles between the Soviet Union and Finland in World War 2 – doubly fascinating because of the German and Italian boats that also found their way to the lake. More on that in a later post. 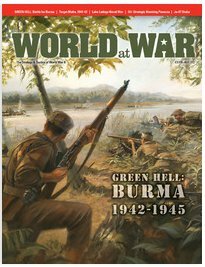 Also in the last issue of World at War is a piece on the Battle of Burma (also fascinating for me), the Aero-Naval Siege of Malta, the Strategic Bombing of Panacea and lastly a piece called “Ugly, Slow, Low and Lethal” – a piece on the Ju-87 Stuka. Sigh – so much reading, so little time. Next business trip is 4 March 2013 so I will catch up on some reading that week at least.